후방 윈도우 블라인드(rear window shade)에 관하여, 탄성중합체 프로파일 스트립들(elastomeric profile strip)이 가이드 레일에 배치되며, 이 가이드 레일에서 풀 로드(pull rod)가 안내되고, 이는 외부 소음(rattle)없이 풀 로드의 각각의 단부를 가이드 레일에 효과적으로 유지(holding)할 수 있다. With respect to the rear window blind (rear window shade), the elastomer of the profile strip is placed on (elastomeric profile strip) the guide rail, this guide rail is a full load (pull rod) is guided, which is full with no external noise (rattle) It can be effectively held (holding) the respective end of the rod to the guide rail. 도 1은 블라인드가 설치된 자동차의 후면도. Figure 1 is a rear view of the vehicle is the blind is installed. 도 2는 본 발명의 후방 블라인드의 도면. 2 is a view of the rear blinds of the invention. 도 3은 단일 립(lip)만을 사용하는 제 1 실시예의 도면. Figure 3 is a view of the first embodiment, which uses only a single rib (lip). 도 4는 두 개의 립을 갖는 실시예의, 가이드 레일의 길이방향 축에 대해 직각인 평면에 따른 단면도. Figure 4 is a cross-sectional view taken along a plane perpendicular to the longitudinal axis of the embodiment, the guide rail having two ribs. 본 발명은 소음 없는 안내 시스템을 가진 윈도우 블라인드에 관한 것이다. The present invention relates to a window blind with a noise-free guide system. 자동차의 후방 블라인드들이 종래기술에 공지되어 있다. It is a car rear blinds are known in the prior art. 오늘날, 후방 윈도우 레지(ledge) 아래에 설치된 권취축(winding shaft)은 거기서 회전가능하게 자리잡고 있고, 보통 이러한 블라인드의 일부다. Today, the take-up shaft is installed under the rear window ledge (ledge) (winding shaft), and is holding there, possibly spot rotation, and usually some of these blinds. 블라인드 웹(web)의 하나의 에지가 권취축에 고정되고, 후방 윈도우 레지의 슬릿을 통해 당겨져 나올 수 있다. The blind being fixed to one of the take-up shaft, the edge of the web (web), may be pulled out through the slit of the rear window ledge. 블라인드 웹 자체가 강성(rigid)이 아니기 때문에, 안내될 필요가 있다. Since the blind web itself is not a stiffness (rigid), it is necessary to be conducted. 이를 위해, 가이드 레일들이 가려질 쪽의 측면들에서 연장하며, 상기 가이드 레일들 내에서 풀 로드 장치(pull rod arrangement)가 안내된다. To this end, it extends from the sides of the side guide rails to be covered, within the guide rails are full load device (pull rod arrangement) is guided. 풀 로드 장치는 블라인드 웹의 최전방 에지에 고정된다. Full load device is secured to the forwardmost edge of the blind web. 즉 블라인드가 연장 및 수축할 때 가장 큰 거리를 이동하는 에지에 고정된다. That is fixed to the moving distance to the largest edge when the blind is extended and contracted. 가이드 레일들은 대략 C자 형상인 단면을 가져, 언더컷 채널(undercut channel)을 형성하며, 이는 슬릿을 통해 외측으로 개방되어 있다. Guide rails are brought substantially C-shaped in cross section, form a channel undercut (undercut channel), which is open to the outside through the slit. 두 개의 가이드 레일의 슬릿들은 서로 마주본다. Slits of the two guide rails facing each other watch. 풀 로드 장치의 가이드 본체들은 이러한 방식으로 안내되어, 가이드 본체들이 가이드 레일의 길이방향 축에 대해 직각으로 당겨질 수 없다. The guide body of the full-load devices are guided in this way, the guide body will not be drawn at right angles to the longitudinal axis of the guide rail. 비록 보통 가이드 본체들(guide bodies)은 스프링에 의해 미리 장력을 받고, 스프링 모터의 작용력이 권취축 상에 블라인드 웹을 감으려고 풀 로드 장치에도 작용할 수 있지만, 이러한 장치들은 소음으로부터 완전히 자유롭지는 않다. Although normally guide the body of the (guide bodies) are also can function under the pre-tension by a spring, to break the force of the spring motor wind the blind web on the take-up shaft full load devices, but such devices are not completely free of noise. 펼쳐진 블라인드에 의해 형성된 평면에 대해 수직으로 작용하는 힘 성분들은, 가이드 레일들을 따라 풀 로드 장치를 이송하기 위해 작동 장치들과 가이드 본체들 사이에서 사용되는 마찰 연결부(frictional connection)에 의해서만 주로 흡수된다. Force component which acts at right angles to the plane defined by the expanded blind are mainly absorbed only by the friction coupling (frictional connection) that is used between the actuator and the guide body in order to transfer the full load apparatus along the guide rail. 이 작용력들은 쉽게 커질 수 있고 가이드 본체들은 횡방향으로 덜그덕거릴 수 있다. This force will be large and easily guide body may hang Horde less in the transverse direction. 이러한 소음이 발생하는지 여부의 문제는 블라인드의 위치, 설치된 위치, 노면 조건으로 인해 발생하는 진동(jarring), 그리고 다른 요인들에 의존한다. Issue of whether these noise depends upon the oscillation (jarring), and other factors caused by the position of the blind, installed location, road surface conditions. 이전의 해법들에 의해서는 이러한 덜그덕거림으로부터 벗어날 수 있다고 확실히 보장되지 않았다. By the previous solution did not quite guarantee that deviate from these less flicker Horde. 이에 근거하여, 본 발명의 목적은 풀 로드 장치가 확실히 덜그덕거림이 없이 가이드 레일 내에서 안내될 수 있는 자동차용 윈도우 블라인드를 생산하는 것이다. The basis object of the invention to produce an automotive window blind for which can be guided in the guide rail without any backlash the full load device certainly less Horde. 본 발명에 따라, 이러한 목적은 청구항 제1항의 특징을 갖는 윈도우 블라인드에 의해 이루어진다. According to the invention, this object is achieved by a window having a Venetian blind of claim 1 characterized. 종래 기술에서와 같이, 신규한 윈도우 블라인드의 풀 로드 장치가 하나 또는 두 개의 가이드 레일 내에서 안내된다. As in the prior art, the full load device of a novel window blind is guided in two guide rails or one. 풀 로드 장치는 이송 또는 작동 장치의 도움을 받아 가이드 레일들을 따라 이동한다. Full load device is moved along the guide rails with the help of the conveying or operating device. 덜그덕거리지 않음을 보장하기 위해, 풀 로드 장치에 의해 탄성적으로 변형되는 하나 이상의 탄성 립(lip)이 가이드 레일의 방향으로 연장한다. To ensure no less Horde georiji, it extends at least one elastic lip (lip) is elastically deformed by the pull rod device in the direction of the guide rail. 풀 로드 장치는 립의 도움을 받아 가이드 레일의 적절한 벽에 대해 탄성적으로 신축성있게 눌리고, 이는 비교적 큰 힘으로 눌린다. Full load device with the help of a lip pressed elastically stretch allows for the appropriate wall of the guide rail, which is pressed with a relatively large force. 이로 인해, 차량의 진동이 풀 로드 장치와 가이드 레일 사이에서 덜그덕 거리는 소음을 유발하지 않는다. As a result, the vibration of the vehicle does not lead to less Horde noises at full load between the device and the guide rail. 또한, 장치는 가이드 레일을 대부분 커버하는 장점을 갖는다. In addition, the device has the advantage that mostly cover the guide rail. 차체의 내장(interior trim)의 색상에 대응하는 색으로 가이드 레일을 설계할 필요가 더 이상 없다. The color having to design the guide rail corresponding to the color of the interior decoration of the car body (interior trim) no more. 가이드 레일은 바람직하게는 알루미늄으로 제조되고, 간단히 압출된 프로파일 부분(extruded profiled section)인 반면, 립이 이러한 색상이면 그것으로 충분하다. The guide rail is preferably made of aluminum, while being simply the extruded profile section (extruded profiled section) which, when the lip such color is enough. 립이 가이드 레일 바로 위에 유지되고 탄성 변형에 의해 밀려나갈 수 없도록, 바람직하게는 립과 가이드 레일을 연결하는데 그들의 형상에 의해서 서로 잡아주는 연결 수단(positive connecting means)이 제공된다. Lip the guide rail is held just above prevents it pushed out by the elastic deformation, preferably to connect the ribs and a guide rail is provided with connecting means for holding each other by their shape (positive connecting means). 그들의 형상에 의해서 서로 잡아주는 연결 수단은 재료-대-재료 연결보다 선호되는데, 왜냐하면 이들은 설치가 간단하고 모든 경우에 영구적이기 때문이다. By their shape connecting means to hold each other's material-to-material connection there is preferred, since they installed it is easy and permanent in all cases. 그들의 형상에 의해서 서로 잡아주는 방식으로 작용하는 유지 수단 또는 연결 수단은 언더컷 홈(undercut groove)에 의해, 또는 L자 또는 Z자 형상의 단면의 스트립(strip)에 의해 구성될 수 있다. Holding means or connecting means acting in a manner to hold together by their shape can be constituted by a, or L-shaped or strip (strip) of the cross-section of Z-shape by the groove undercut (undercut groove). 립은 대응하는 고정 장치를 갖는다. Lip has a holding device that corresponds. 가이드 레일은 바람직하게는 이를 본체에 쉽게 고정하기 위해 연속적인 플랜지 스트립(continuous flange strip)을 구비한다. Guide rails are preferably provided with a continuous flange strip (continuous flange strip) to facilitate securing them to the body. 나아가, 가이드 레일은 측면 내장의 일부가 그 위에 고정되는 플랜지 스트립을 가질 수 있다. Further, the guide rail may have a flange strip a portion of the internal side of which is fixed thereon. 단 하나의 립이 사용되는 경우에, 소음 방지에 부가하여 가이드 레일의 양지 부분(shiny portion)을 덮는 효과를 원한다면, 풀 로드 장치가 위치하는 지점에서 립을 크게 변형시킬 필요가 있다. In the case where only one rib is used, the effect desired in addition to the anti-noise covering the note section of the guide rail (shiny portion), there is a full load device is required to greatly modify the lip to the nearest point to. 이러한 큰 변형을 원하지 않는다면, 하나의 립 대신에 두 개의 립을 사용하는 것이 실용적이며, 여기서 립들 사이의 연결부(joint)는 슬릿의 경로를 따른다. If you do not want such a large deformation, and it is practical to use two ribs instead of one lip, wherein the connection (joint) between ripdeul follows the path of the slit. 본 발명에 따른 윈도우 블라인드는 블라인드 웹의 경로를 따라 그 폭이 변하는 윈도우와 관련해서도 사용될 수 있다. Window blinds in accordance with the present invention can also be used in connection with the window width is changed along the path of the blind web. 이를 위해 풀 로드 장치는 망원경의 길이가 변화하는 것처럼 그 길이가 신축가능한 방식으로 변할 수 있다. To this end, fully loaded device can be varied in such a way that its length can stretch as you change the length of the telescope. 즉, 망원경 처럼 풀로 로드 장치의 양 단부가 중심부 내에 삽입될 수 있게 구성되어 그 길이가 신축가능하게 조정된다. That is, the both end portions of the pool, the load device as a telescope is configured such that it can be inserted in the center of its length is adjusted to enable expansion and contraction. 중심부(center piece)에 의해 조정될 수 있는 안내 부재들이 구비된다면 가변성(changeability)이 얻어질 수 있다. If the heart are provided (center piece), which guide member can be adjusted by the variable (changeability) it can be obtained. 가이드 본체들의 단면은 가이드 레일내의 채널의 단면과 정합한다. Cross-section of the guide body is matched with the cross-section of the channel in the guide rail. 또한, 다른 개선 사항은 종속항의 주제이다. In addition, other improvements are the subject of the dependent claims. 이에 관련하여, 특징들의 조합도 청구될 수 있는 것으로 고려되어야 하며, 이는 특정 실시예에 의해 한정되지 않는다. This regard, should be considered to be charged is also a combination of features, which are not limited by the specific embodiments. 본 발명의 과제의 실시예가 도면에 도시되어 있다. An embodiment of the object of the present invention is shown in the drawing. 도 1은 지붕(2), 트렁크(3), 및 두 개의 C자형 기둥(4, 5)을 갖는 승용차(1)의 후면도를 개략적으로 도시한다. Figure 1 schematically shows a rear view of the roof (2), the trunk (3), and the car (1) having two C-pillar (4, 5). 후방 윈도우 개구(6)가 상기 두 개의 C자형 기둥들(4, 5) 사이에 위치하며, 상부에서는 후방 지붕 에지(7)에 의해서, 하부에서는 윈도우 레지(ledge)(8)에 의해서 경계지어진다. The rear window opening 6 that the two C-pillars (4, 5) located between, the upper portion in by the rear roof edge (7), a lower bounded by the window ledge (ledge) (8) . 후방 유리창(9)은 차창용 고무 스트립(window rubber strip)에 의해 접착되어, 예를 들어 공지된 방식으로 후방 윈도우 개구에 설치된다. A rear window glass 9 is bonded by a rubber strip chachangyong (window rubber strip), for example, it is provided on the rear window opening in a known manner. 하부 윈도우 에지(8)와 도면에서는 보이지 않는 후방 시트 백(rear seat back) 사이에서 수평으로 연장되는 선반(10)은 승용차 내부에서 후방 유리창(9)의 내측의 앞에 위치한다. In the lower window edge (8) with a view extending horizontally between visible rear seat back (rear seat back) that the shelf 10 is located in front of the inside of the rear window (9) in a car. 곧은 출구 슬릿(11; outlet slit)이 선반(10)에서 연장된다. Straight exit slit; a (11 outlet slit) extends from the shelf 10. 출구 슬릿(11)은 후방 유리창 블라인드(12)의 일부이며, 이 유리창 블라인드의 기본적 구조가 도 2에 매우 개략적으로 도시되어 있다. Exit slit (11) is part of the rear window blind 12, the basic structure of the window blind is illustrated very schematically in Fig. 후방 유리창 블라인드(12)는 블라인드 웹(13)을 가지며, 이 블라인드 웹(13)은 도 1에서 연장된 상태로 도시되어 있다. Rear window blind (12) has a blind web (13), a blind web 13 is shown in an extended state in Fig. 이 블라인드 웹은 전체 형상이 사다리꼴인 후방 윈도우를 가리기 위해 사다리꼴 형상을 갖는다. The blind web has a trapezoidal shape to cover the rear window of the overall trapezoidal shape. 도 2가 도시하는 바와 같이, 권취축(winding shaft)(16)이 두 개의 각진 브라켓(14, 15)의 도움으로 선반(10) 아래에 회전가능하게 설치된다. Also, the spool (winding shaft) (16) is rotatably mounted under the shelf 10 with the help of the two angled brackets 14 and 15, as the second city. 블라인드 웹(13)의 하나의 에지가 권취축(16) 상에 고정된다. Blind one edge of the web (13) is fixed on the take-up shaft (16). 권취축(16)으로부터 먼 쪽의 다른 에지는 풀 로드 장치(pull rod arrangement)(17)와 연결된다. The other edge of the side farther from the winding shaft 16 is coupled to the full-load device (pull rod arrangement) (17). 권취축(16)은 권취축(16) 내부에 있는 스프링 모터(도시되지 않음)에 의해 블라인드 웹(13)을 감는 방향으로 미리 장력을 받는다(pre-tensed). The take-up shaft 16 is the take-up shaft 16 is subjected to pre-tension in the direction of winding the blind web (13) by the spring motor (not shown) in the interior (pre-tensed). 풀 로드 장치(17)의 2개의 가이드 부재(19)가 도시되어 있으며, 이 가이드 부재들은 실질적으로 신축가능한 방식(telescope-like manner)으로 변위될 수 있다. And the two guide members 19 of the pull rod (17) is shown, this guide member can be displaced in a substantially elastic manner (telescope-like manner). 신축가능한 방식으로 변위될 수 있는 이 가이드 부재(19)는 두 개의 가이드 레일(20, 21) 내에서 주행하며, 이 레일들은 차량 내측에서 윈도우 개구(6)의 측방향 에지들의 다른 측면 상에서 연장되어, 바깥쪽에서 볼 수 없다. Stretching the guide member 19 which can be displaced in a way that shall run in the two guide rails 20,21, the rails are extended on the other side of the lateral edge of the window opening 6 in the vehicle inner side I can not see, from the outside. 도면부호 22로 점선으로 나타낸 스러스트 부재들이 두 개의 가이드 레일(20, 21) 내부에서 주행한다. The thrust member by the reference numeral 22 indicated by a dotted line to be run within the two guide rails 20,21. 가이드 레일들(20, 21)은 선반 아래에서 안내관(23, 24)으로서 계속되며, 이 안내관을 통해서 가이드 레일들(20, 21)이 기어 모터(27)의 기어(26)와 연결된다. The guide rails (20, 21) is connected with the gear 26 of the guide tubes (23, 24) as still is, the guide rail through the guide tubes (20, 21) of the gear motor 27 under the shelf . 스러스트 부재들(22)은 안내관들(23, 24) 및 가이드 레일들(20, 21)을 통해 연장된다. The thrust member 22 extends through the guide tube (23, 24) and guide rails (20, 21). 스러스트 부재들(22)은 외측에 나선형으로 연장하는 리브(rib)를 구비한 바우든 케이블(Bowden cables)과 유사한 선-형상의 가요성(flexible) 요소들이다. The thrust member 22 is similar to the bow either cable (Bowden cables) with a rib (rib) extending in a helical line on the outside - they are flexible in shape (flexible) element. 리브들의 도움으로, 스러스트 부재들(22)은 점선으로 나타낸 출력 기어 휠(28)과 맞물린다. With the aid of ribs, and the thrust member 22 is engaged with the output gear wheel indicated by the dotted line 28. 가이드 레일들(20, 21) 내부에 위치하는 스러스트 부재들(22)의 자유단들은 가이드 부재(19)들과 함께 작용한다. The free end of the guide rail of the thrust member which is located in the inner (20, 21, 22) are acting together with the guide member 19. 차체의 주변 부분들을 포함하여, 가이드 레일(21)의 구조 및 디자인을 나타내는 상세도가 도 3에 도시되어 있다. Including the peripheral portion of the vehicle body, showing a detail of the construction and design of the guide rail 21 also it is shown in FIG. 가이드 레일(20)의 구조 및 차체에의 설치는 동일하므로, 가이드 레일(21)에 의한 설명으로 충분하다. Building and assembly of the vehicle body of the guide rail (20) is sufficient to describe by a guide rail (21) are identical. 차체의 외곽(31; outer shell)의 일부분이 도 3에 도시되어 있으며, 이는 도면부호 32에서 플랜지를 형성하며, 그 위에 유리창(9)이 탄성중합체(elastomeric) 재료(33)에 의해 접착되어 있다. A vehicle body of the outer frame; and a portion of (31 outer shell) is shown in Figure 3, which form a flange at the numeral 32, a glass window (9) thereon is bonded to the elastic polymer (elastomeric) material 33 . 또한, 도 3의 부분도는 차체의 내곽(34; inner shell)의 일부분을 도시하며, 이 역시 예를 들어 점 용접에 의해 플랜지(32)와 연결된 플랜지(35)를 구비한다. The partial view of Figure 3 of the vehicle body naegwak; shows a portion of the (inner shell 34), and this, too, for example a flange 35 connected to the flange 32 by a spot weld. 몇 개의 설상부들(tongues) 또는 클립들(36)이 플랜지(35)로부터 절취되고(notched) 가이드 레일(21)을 고정하기 위해서 서로 등간격으로 이격되어 위로 밀린다. Some wedge portions (tongues) or clips 36 is cut out from the flanges (35) (notched) are spaced apart from each other at equal intervals in order to secure the guide rail 21 is pushed up. 가이드 레일(21)은 압출 성형된 알루미늄 부재이며, 그 위에 플랜지(37)가 형성되어 있으며 가이드 레일(21)의 길이에 걸쳐 연장한다. A guide rail (21) is an aluminum extruded member, and the flange 37 is formed on and extends over the length of the guide rail (21). 플랜지(37)는 클립(36) 상에 편평하게 놓여 있다. Flange 37 may lie flat on the clip (36). 플랜지(37)는 구멍(38; bore)을 포함하며, 이 구멍은 각각의 클립(36)의 높이에 위치하고, 클립(36)의 구멍(39)과 정렬되어 있다. Flange 37 has a hole (38; bore) includes, a hole is located at the height of each clip 36, it is aligned with the holes 39 of the clip 36. 블라인드(blind) 리벳(41)이 이들 구멍들을 통해 연장하며, 이에 의해 플랜지(37)가 클립(36)과 확실하게 연결된다. It extends through the blind (blind) with rivets (41) of these holes, whereby the flange (37) is connected securely with the clip (36). 이런 식으로 가이드 레일(21)이 후방 유리창(9)의 측방향 에지를 따라 몇 개의 고정 지점들에서 차체와 연결된다. In this way, the guide rail 21 is connected to the vehicle body and in some fixed points along the lateral edges of the rear window (9). 플랜지(37)에서 시작하여, 가이드 레일(21)의 프로파일은 두 개의 레그(42, 43)를 형성하며, 이는 이들 사이에 부분적으로 원통형인 가이드 홈(44)을 형성한다. Starting at the flange (37), the profile of the guide rail 21 to form two legs (42, 43), which form part of a cylindrical guide groove 44 therebetween. 길이방향 스트립들(45, 46)이 형성되기 때문에, 외측으로 통하게 하는 슬릿(47)이 형성되며, 그 간극(clearance)은 가이드 홈(44)의 내경보다 작다. Because of the longitudinal strips (45, 46) is formed, a slit (47) communicated to the outside is formed, and the gap (clearance) is smaller than the inner diameter of the guide groove (44). 스트립(46)에 뒤이어, 레그(42)는 플랜지(48)로 이어지며, 이는 유리창(9)의 표면에 대해 거의 직각으로 연장한다. Following the strip 46, the leg 42 leads to a flange 48, which extends substantially at right angles to the surface of the windshield (9). 플랜지(48)는 차체의 내장(interior trim)(49)의 일부에 대해 고정용 플랜지로서 사용된다. Flange 48 is used as a flange for fixing to the internal portion of the vehicle body (interior trim) (49). 레그(43)는 가이드 홈(44)을 지나 계속 연장하고 플랜지(51)를 형성하며, 이는 플랜지(48)와 평행하게 연장하며, 플랜지(52)의 중심에서 종료한다. The leg 43 is continued and extended through the guide groove 44 to form a flange 51, which extends parallel to the flange 48, ends at the center of the flange 52. 플랜지들(51, 52)은 T자 형상의 프로파일 부분을 구성한다. The flanges (51, 52) constitutes a portion of the T-shaped profile. 플랜지들(51, 52)로 구성된 T자 형상의 프로파일 부분이 탄성중합체(elastomeric) 프로파일 스트립(53)을 확실히 잡아주는데 사용되며, 이는 탄성중합체 재료로 만들어진 립(54)을 형성한다. The profile portions of the flanges (51, 52) consisting of a T-shape is used juneunde certainly hold elastomers (elastomeric) the profile strip (53), which forms a lip 54 made of elastomeric material. 그 뿌리 부분(root)에서, 립(54)은 T자 형상의 홈(56)을 포함하는 두꺼운 부분(55)으로 이어지며, 이 홈(56)은 플랜지들(51, 52)에 의해 만들어진 프로파일 부분에 확실하게 끼워진다. From the root portion (root), the lip (54) leads to the thick portion (55) including a groove (56) of the T-shape, the groove 56 is a profile created by the flanges (51, 52) It is securely fitted to the part. 다른 립(57)이 두꺼운 부분(55)에 인접하게 존재하며, 유리창(9)과 두꺼운 부분(55) 사이에서 몰리게 하지 않으면서, 발생가능한 갭을 막기 위해 유리창(9)을 밀봉하도록 놓인다. And another rib (57) is present adjacent to the thick portion 55, is placed to seal the window (9) and unless rushes between the thick portion 55 is on, the window in order to prevent a possible gap (9). 도 3에서 볼 수 있는 단면 프로파일을 갖는 립(54)이 가이드 레일(21)의 전체 길이에 걸쳐, 즉 적어도 후방 윈도우의 상부 에지(7)로부터 출구 슬릿(11)까지 연장한다. Lip 54 has a cross-sectional view profiles that in Figure 3 over the entire length of the guide rail 21, that extends to the exit slit 11 from the upper edge 7 of at least the rear window. 립(54)은 가이드 레일(21)의 슬릿(47)을 커버하고, 유리창(9)으로부터 먼 쪽의 에지가 측방향 내장(49)에 놓인다. Lip 54 covers the slit 47 of the guide rail 21, and is situated in a window (9) is laterally embedded portion 49 of the side farther from the edge. 가이드 부재(19)는 본질적으로 원통형인 축(58)을 가지며, 이는 풀 로드 장치(17)의 중심부(도시되지 않음)에서 신축가능한 방식으로 변위될 수 있다. Guide member 19 has an essentially cylindrical shaft (58), which can be displaced in telescopic manner as possible from the center (not shown) of the pull rod (17). 즉, 망원경 처럼 풀로 로드 장치(17)의 양 단부가 중심부 내에 삽입될 수 있게 구성되어 그 길이가 신축가능하게 조정된다. That is, the both end portions of the pool, the load device 17 such as a telescope configured such that it can be inserted in the center of its length is adjusted to enable expansion and contraction. 그 자유단에서, 원통형 축(58)은 볼 형상의 또는 원통형의 가이드 본체(59)를 가지며, 이는 가이드 홈(44)에서 슬라이딩 방식으로 이동한다. In its free end, a cylindrical shaft (58) has a shape of a ball or a cylindrical guide body 59, which moves in a sliding manner in a guide groove (44). 또한, 가이드 본체(59)의 길이방향 치수는 그 횡방향의 치수 보다 더 크고, 이에 따라 상기 가이드 본체(59)가 상기 가이드 레일(20, 21)에 대해 회전할 수 없다. Further, the longitudinal dimension of the guide main body 59 can not be rotated about that of the transverse dimension larger than, and thus the guide body 59, the guide rails (20, 21) along. 립(54)은 측방향 내장(49)의 에지와 레그(43) 사이의 갭을 실제로 완전히 커버하며, 원통형 축(58)이 존재하는 지점에서 원통형 축(58)에 의해 탄성적으로 개방된 상태를 유지한다. Lip 54 is a side actually completely cover the gap between the edge and the leg 43 in the direction of built-in (49), and a cylindrical shaft (58) is present point opening in a resiliently by a cylindrical shaft 58 which conditions to be maintained. 그러나, 그 고유한 탄성 때문에, 립(54)은 측방향 내장(49) 상에, 즉 가이드 레일(21)의 이어지는 경로에서 축(58) 위에 그리고 아래에 다시 놓인다. However, because of its inherent elasticity, the lip 54 on the internal lateral (49), that is placed back in the shaft 58 above and below in the following path of the guide rail (21). 립(54)은 축(58)의 부근에서만 상승된다. Lip 54 is raised only in the vicinity of the shaft (58). 립(54)의 고유한 탄성 때문에, 축(58)에 연속적으로 힘이 가해지고, 도시된 배치에서 가이드 홈(44)의 대향하게 위치한 가장자리(rim) 영역을 향하는 방향으로 유리창(9)으로부터 멀어지게 축(58)을 미는 경향이 있다. Because of the unique elastic lip 54, the moving away being a continuous force to the shaft 58 is applied, as toward the oppositely located edge (rim) areas of the guide groove 44. In the illustrated arrangement direction from the window (9) be the shaft 58 has a tendency to push. 이 과정 중에 발생하는 예비-장력(pre-tensioning)은 풀 로드 장치(17)에서의 진동이 가이드 본체(59)를 벽 영역으로부터 떨어져 들어올릴 수 없게 할 정도로 크며, 여기서 이 벽 영역에 대해 가이드 본체(59)가 립(54)의 고유한 탄성으로 인해 가압된다. Preliminary generated during the process-tension (pre-tensioning) is large and the variation in the pull rod (17) the guide body (59) enough to not be able to lift away from the wall zone, wherein the guide body on this wall area 59 is pressurized due to the inherent resiliency of the lip 54. 다르게는, 블라인드는 구동 모터(27)가 시동되었을 때 개략적으로 도시한 스러스트 부재들(22)이 가이드 레일들(20, 21) 내에서 앞으로 밀리는 방식으로 작동한다. Alternatively, the Venetian blind is operated in a manner being pushed forward within the thrust member schematically shown when the drive motor 27 is start-up (22) the guide rail (20, 21). 그러므로, 이들은 풀 로드 장치(17)의 가이드 본체(59)를 자기자신보다 앞으로 밀고, 풀 로드 장치는 그 전체 주행 중에 립(54)에 의해 가이드 홈(44)의 벽에 대해 꾸준히 밀리게 된다. Therefore, it is pushed forward to the guide body 59 of the pull rod (17) than his own, pull rod apparatus is to continue millimeters for the wall of the guide groove 44 by the lip 54 during the entire run. 모터(27)가 반대쪽 방향으로 작동하게 되면, 스러스트 부재들(22)은 가이드 부재들(20, 21)로부터 후퇴한다. When the motor 27 operate in opposite directions, and the thrust member 22 is retracted from the guide members 20,21. 풀 로드 장치(17)는 권취축(16) 내에 자리잡은 스프링 모터가 블라인드 웹(13)을 통해 풀 로드 장치(17)에 전달하는 힘 때문에 이러한 역방향 운동을 따른다. Full load device 17 follows this backward movement because of the power to pass to the take-pull rod (17) is situated in the spring motor 16 through the blind web (13). 도 4에 약간 수정된 실시예가 도시되어 있으며, 이는 하나의 립(54)을 갖는 하나의 프로파일 스트립(53) 대신에 두 개의 립(63, 64)을 갖는 두 개의 프로파일 스트립(60, 61)이 사용된다는 점에서 도 3의 실시예와 실질적으로 상이하다. Figure 4 is an embodiment showing a slight modification to and which two profile strips (60, 61) having two ribs (63, 64) in place of one of the profile strip (53) having a lip (54) used is substantially different from the embodiment of Figure 3 in that it is. 도 3의 실시예의 구성요소들과 기능적으로 상응하는 구성요소들에 관해서는, 동일한 도면부호를 사용하고 상세한 설명은 다시 하지 않는다. As for the components to functionally equivalent with the embodiment of the component of Figure 3, the same reference numerals and detailed description thereof will not be again. 도 3의 실시예에서는 플랜지(37)가 두 개의 레그들(42, 43) 사이의 중간에서 연장하는 반면, 도 4의 실시예에서는 직각으로 만곡되고, 레그(42)의 연장부를 구성한다. In the embodiment of Figure 3 it is bent at a right angle, whereas in the embodiment of Figure 4 extending from the middle between the flange 37 has two legs 42 and 43, and constitutes an extension of the leg (42). 레그(42)의 자유단은 L자 형상으로 각진 스트립(65)에서 종료하며, 이 스트립은 탄성중합체(elastomeric) 프로파일 스트립(61)을 위한 유지 부재로서 사용된다. The free end of the leg 42 and terminates at an angled strip (65) in an L-shape, a strip is used as a holding member for the elastomer (elastomeric) the profile strip (61). 레그(66)는 Z자 형상으로 만곡되고 측방향 내장(49)을 위한 지지용 플랜지(67)에서 종료하며, 가이드 홈(44)의 거의 중심으로부터 연장한다. Leg 66 is bent into a Z-shape and ends in a support flange (67) for laterally for internal (49) and extends from approximately the center of the guide groove (44). L자 형상의 지지 홈(68)이 레그(66)와 L자 형상의 스트립(65) 사이에 형성되고, 이는 탄성중합체 프로파일 스트립(61)을 효과적으로 고정한다. Support groove 68 of the L-shape is formed between the leg 66 and the strip 65 of L-shape, which effectively secures the elastomeric profile strip (61). 프로파일 스트립(61)은 L자 형상의 스트립(65) 주위에서 그리고 L자 형상의 홈(68) 안으로 연장한다. Profile strip 61 extends around the strip (65) L-shaped, and into the groove 68 of the L-shape. 이완된 상태에서, 립(63, 64)의 자유단은 거의 가이드 홈(44)의 중심을 따라 연장한다. In a relaxed state, the free end of the lip (63, 64) extends substantially along the center of the guide groove (44). 다른 레그(43)도 L자 형상으로 각진 스트립(69)에서 종료하며, 상보하는 홈(71; complementary groove)을 갖는 프로파일 스트립(60)이 스트립(69) 상에서 가압된다. And the other leg (43) also terminates at the angled strip (69) in an L-shape, complementary grooves; profile strip (60) having a (complementary groove 71) is pressed on strip (69). 또한, 프로파일 스트립(60)은 후방 유리창(9)의 내측에 대해 놓이는 립(57)을 구성한다. In addition, the profile strip (60) consists of a lip (57) lies against the inside of the rear window (9). 이완된 상태에서, 즉, 축(58)이 두 개의 립들(63, 64) 사이의 적합한 위치에 있지 않으면, 이 립들(63, 64)은 서로에 대해 같은 높이가 되게 놓인다. In a relaxed state, i.e., not in the appropriate position between the shaft 58 are two ripdeul 63 and 64, the ripdeul (63, 64) is placed so it is flush with respect to each other. 또한, 두 개의 립들(63, 64)에 의해 작용되는 큰 예비-장력에 의해 덜그덕거리지 않음이 보장된다. In addition, two large spare ripdeul exerted by the (63, 64) is guaranteed to be no less georiji Horde by tension. 축(58)과의 접촉 지점에서, 이들은 마찰 감쇠기(friction damper)로서 작용하고, 이들은 이 위치에서 진동을 감쇠시킨다. At the contact point of the axis 58, which acts as a friction damper (damper friction), and these attenuate the vibration at this position. 두 개의 탄성중합체 프로파일 스트립들(60, 61)은 내장(49)의 내측에 의해 형성된 표면의 연장선에서 연장하며, 립(63 또는 64)이 이완될 때 연속적인 표면을 형성한다. Two of the elastomeric profile strip (60, 61) extends in extension of the surface formed by the inner side of the internal (49) and forms a continuous surface when the lip to relax (63 or 64). 이전의 실시예에서와 같이, 이에 의해 가이드 레일(21)과 가이드 홈(44)이 커버된다. As in the previous embodiments, so that the guide rail 21 and guide groove 44 is covered by. 프로파일 스트립(60, 61), 및 립(54)을 구성하는 프로파일 스트립(53)의 도움을 받아, 측방향 내장(49)의 색상이 연속되게 할 수 있다. The profile strips (60, 61), and with the help of the profile strip (53) constituting the rib 54, may be color-side direction, a series of built-in (49). 가이드 레일 자체의 색상은 더 이상 중요하지 않다. The color of the guide rail itself is not important anymore. 이는 더 이상 외관에 간섭하지 않는다. This does not interfere with the further appearance. 후방 블라인드와 관련하여, 탄성중합체 프로파일 스트립들은 가이드 레일들에 배치되며, 이 가이드 레일에서 풀 로드가 안내되고, 이는 풀 로드의 각각의 단부를 덜그덕거림 없이 효과적으로 잡아줄 수 있다. In relation to the rear blind, is disposed in the elastomeric profile strip have guide rails, the pull rod is guided in a guide rail, which can give out effectively without backlash less Horde the respective end of the pull rod. 본 발명에 의해, 풀 로드 장치(pull rod arrangement)가 확실히 덜그덕거림이 없이 가이드 레일에서 안내될 수 있는 자동차용 윈도우 블라인드가 제공된다. According to the present invention, the full-load device (pull rod arrangement) is firmly car window blind for which can be guided in the guide rail without the flicker less Horde is provided. 상기 풀 로드 장치(17)와 접촉하고 상기 풀 로드 장치(17)에 의해 탄성적으로 변형하도록 배치되어 상기 가이드 레일(20, 21)을 따라 연장하는 하나 이상의 탄성 립(54, 63, 64)을 갖는 자동차용 윈도우 블라인드. The pull rod (17) and the contact and is arranged to elastically deformed by the pull rod (17) the guide rail (20, 21) at least one elastic lip (54, 63, 64) extending along the Car window blind for having. 상기 립(54, 63, 64)은 탄성 프로파일 스트립(53, 60, 61)상에 형성되는 것을 특징으로 하는 자동차용 윈도우 블라인드. Wherein the lip (54, 63, 64) for automotive window blind, characterized in that formed on the elastic profile strip (53, 60, 61). 상기 가이드 레일(20, 21)은 절삭가공되어 길이방향으로 연장하는 가이드 홈(44)을 형성하며, 상기 홈은 길이방향으로 연장하는 연속 슬릿(47)을 통해 외측으로부터 접근 가능하고, 상기 슬릿(47)의 간극은 동일 방향에서 측정한 가이드 홈(44)의 폭보다 작은 것을 특징으로 하는 자동차용 윈도우 블라인드. The guide rail (20, 21) is cut is machined to form a guide groove 44 extending in the longitudinal direction, the recess is accessible from the outside through a continuous slit 47 extending in the longitudinal direction, and the slit ( 47) of the gap is for automobile window blind, characterized in that is less than the width of the guide groove 44, measured in the same direction. 상기 가이드 홈(44)은 원형 단면을 갖는 것을 특징으로 하는 자동차용 윈도우 블라인드. The guide groove 44 is for a car window blind, it characterized in that it has a circular cross section. 상기 가이드 레일(20, 21)은 고정 플랜지(37)를 갖고, 이 플랜지(37)는 본질적으로 상기 가이드 레일(20, 21)의 전체 길이에 걸쳐 연장하는 것을 특징으로 하는 자동차용 윈도우 블라인드. The guide rail (20, 21) has a fixing flange 37, the flange 37 is essentially a window blind for automobile, characterized in that extending over the entire length of the guide rail (20, 21). 상기 가이드 레일(20, 21)은 압출 성형된 부재로 만들어지는 것을 특징으로 하는 자동차용 윈도우 블라인드. The guide rails 20 and 21 for automotive window blind, characterized in that is made of an extrusion member. 상기 가이드 레일(20, 21)은 탄성 립(54, 63, 64)을 그들의 형상에 의해 서로 잡아주는 방식으로(positive) 고정하기 위한 유지 수단(51; 65, 68, 69)을 갖는 것을 특징으로 하는 자동차용 윈도우 블라인드. The guide rail (20, 21) is resilient lip (54, 63, 64) to a method for holding each other by their shape (positive) holding means for fixed; characterized in that it has a (51 65, 68, 69) car window blinds for that. 상기 탄성 립(54, 63, 64)을 고정하기 위한 상기 유지 수단(51, 65, 68, 69)은 T자 형상의 단면을 가진 스트립에 의해 또는 언더컷 홈에 의해 구성되는 것을 특징으로 하는 자동차용 윈도우 블라인드. The elastic lip (54, 63, 64) for the holding means for fixing (51, 65, 68, 69) for automobiles, characterized in that constituted by or undercut groove by a strip with a cross-section of a T-shaped window blinds. 상기 립(54, 63, 64)에는 상기 립(54, 63, 64)을 상기 가이드 레일(20, 21)에 그들의 형상에 의해서 서로 잡아주는 방식으로(positively) 연결하기 위해 대응하는 고정 장치를 구비하는 것을 특징으로 하는 자동차용 윈도우 블라인드. Wherein the lip (54, 63, 64) is provided with a fixing device corresponding to the method for holding together (positively) connected by their shape to the rib (54, 63, 64) the guide rail (20, 21) Car window blind for characterized in that. 상기 가이드 레일(20, 21)은 자동차의 측방향 내장(49; lateral trim)의 일부분을 수용하는 플랜지(48, 67)를 갖는 것을 특징으로 하는 자동차용 윈도우 블라인드. The guide rails 20 and 21 are embedded side direction of the vehicle; car window blind, characterized in that for having a flange (48, 67) for receiving a portion of the (lateral trim 49). 상기 하나 이상의 탄성 립은 두 개의 립(63, 64)으로 구성되는 것을 특징으로 하는 자동차용 윈도우 블라인드. 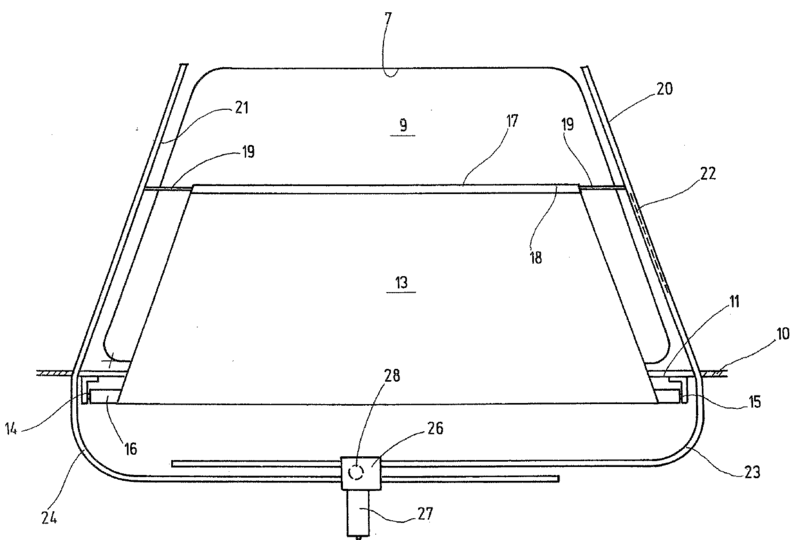 Car window blind for being configured with the at least one resilient rib is two ribs (63, 64). 두 개의 립(63, 64)이 이완된 상태에서는 서로 직접 닿는 것을 특징으로 하는 자동차용 윈도우 블라인드. The two ribs (63, 64) is a relaxed state for the car window blind, characterized in that direct contact with each other. 상기 립(54, 63, 64)은 슬릿(47)을 커버하는 방식으로 구성되는 것을 특징으로 하는 자동차용 윈도우 블라인드. Wherein the lip (54, 63, 64) for automotive window blind, characterized in that configured in such a manner as to cover the slit (47). 상기 풀 로드 장치(17)의 길이가 신축가능한 방식(telescope-like manner)으로 조정될 수 있도록, 상기 풀 로드 장치(17)는 양 단부들이 중심부 내로 삽입가능하게 구성되어 있는 것을 특징으로 하는 자동차용 윈도우 블라인드. To be adjusted in such a way (telescope-like manner) possible length stretching of the pull rod (17), said pull rod (17) is automotive window for, characterized in that both end portions are configured to be inserted into the heart blind. 상기 풀 로드 장치(17)는 일단부 상에 가이드 본체(59)를 갖고, 이는 상기 가이드 레일(20, 21)과 함께 작동하는 것을 특징으로 하는 자동차용 윈도우 블라인드. The pull rod (17) has one end has a guide body (59) in a portion, which is for automobile window blind, characterized in that to work together with the guide rails (20, 21). 상기 가이드 본체(59)는 축(58)을 통해 상기 풀 로드 장치(17)와 연결되고, 상기 가이드 레일(20, 21)의 길이방향 연장선에 대해 횡방향으로 측정하였을 때 상기 축(58)은 상기 가이드 본체(59)보다 작은 직경을 갖는 것을 특징으로 하는 자동차용 윈도우 블라인드. The guide body 59 is connected to the pull rod (17) through the shaft 58, the shaft 58 as measured transverse to the longitudinal extension of the guide rail (20, 21) is Car window blind according to claim one having a smaller diameter than the guide body (59). 상기 가이드 본체(59)는 원형 단면을 갖는 것을 특징으로 하는 자동차용 윈도우 블라인드. The guide body 59 is for car window blind, it characterized in that it has a circular cross section. 길이방향의 상기 가이드 본체(59)의 치수는 횡방향의 치수 보다 더 커서, 상기 가이드 본체(59)가 상기 가이드 레일(20, 21)에 대해 회전할 수 없는 것을 특징으로 하는 자동차용 윈도우 블라인드. The cursor, the guide body 59, the car window blind according to claim that can not rotate relative to the guide rail (20, 21) than the dimensions of the transverse dimensions of the guide body 59 in the longitudinal direction. FR902518A (en) * 1943-03-20 1945-09-03 Guidance System rods mechanical blinds, sliding windows of vehicle windows, etc. DE1905163U (en) * 1964-09-12 1964-11-26 Karl Sturm Rollo. ES2233554T3 (en) 2005-06-16 light motor vehicle door. ES2242683T3 (en) 2005-11-16 Vehicle roof modular.